Institute of Management Technology (IMT), Hyderabad which has been recently awarded – ‘Best Upcoming B-School in South India’, invites applications for PGDM programs for the batch 2017-19. Interested students can apply online. Candidate should have valid CAT/GMAT/CMAT/XAT Score. Last date to apply is Dec 01st 2016. 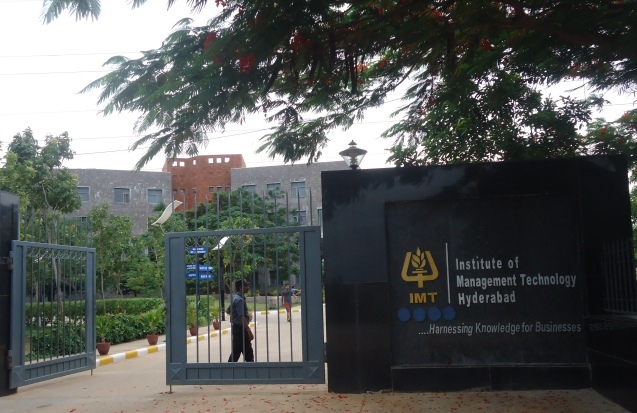 IMT Hyderabad, the fourth and the youngest IMT to be established in the year 2011 completed the placement for the 2014-16 batches with highest package offered being INR 21 Lacs per annum and the average salary offered was INR 6.5 lac per annum by 80 plus recruiters. The institute which is in the outskirts of Hyderabad situated in 30 acre lush green campus with state-of-the-art facilities, has tie ups with 20 Global University for student exchange programs. Applicants for all IMT PGDM programs must have a minimum three-year Bachelor’s degree or equivalent with minimum 50 percent aggregate marks in any discipline. Applicants who are appearing for the final-year degree examination can also apply provided they submit their pass certificates with minimum 50% of marks in aggregate, latest by 30 September 2017 to the Academic Program Office of IMT. To apply for 2 year PGDM program, applicants must be registered for CAT-2016 or XAT-2017 or CMAT-2017 test or have taken the GMAT (1st January 2013 – 31 March 2017). In case of the candidate(s) applying on the basis of GMAT and score is not provided, processing of application will be provisional, subject to IMT receiving the official GMAT score on or before April 15, 2017. One can directly apply now at http://www.imthyderabad.edu.in/ online. Application Fees: INR 2000. Seats: 240.